Good books, good music and good movies are like good food for the soul. Some make us cry, some make us laugh, some stir our hearts to the core and some make us thankful for the good things God provides us with in life. Some movies make you appreciate the talents of others, be it singing, dancing or art. This lazy Sunday, after a meal of thin crust pizza and strawberry gelato,(at the famous Yuls/Aquadrome) hubby and I watched the movie ‘Step up Revolution – We are The Mob” on telly. Its amazing how dancers are able to control every muscle in their body to perform a robotic dance, or the women appear to flit around like butterflies performing a contemporary routine or the dancers are so agile and acrobatic while performing hip hop. Getting a social or political message across through dance is like a peaceful revolution. I enjoyed watching the movie and forgot about blogging for a over an hour. Watch the movie, you will surely love it. And of course whenever you are in Mombasa, do visit Aquadrome for a lazy Sunday lunch, by the beach, good food and dessert. Remember I mentioned a few days ago about my niece from Nairobi, who brought loads of fresh basil for me. Well she had also brought some pak choy (pak choi, bak choy,chinese cabbage) for me. I made some stir fry with it and forgot to blog the recipe. Delicious, healthy and crunchy, this dish can be served with noodles or rice or eat it on its own as a healthy fill my tummy option. I decided to add snow peas(mangetout) to it. Trim the ends of the snow peas. Cut them into half and wash them. Boil some water in a pan. When it begins to boil add the snow peas. Leave for 2 minutes and remove the peas from the hot water. Run cold water over it. Keep it on the side till required. Pull apart the stalks of pak choy. Trim the ends. Wash the pak choy properly. Chop it roughly into big junks. I cut each leaf into 3 parts. Heat both the oils in a wide pan over high heat. Add sesame seeds, ginger and garlic. Stir it and add the pak choy. Stir fry till it wilts. Add the snow peas stir fry. Add the red chillis, salt and serve immediately. Add chopped cashew nuts if you like. One cooking, the cabbage will leave out water.This acts like a watery sauce. 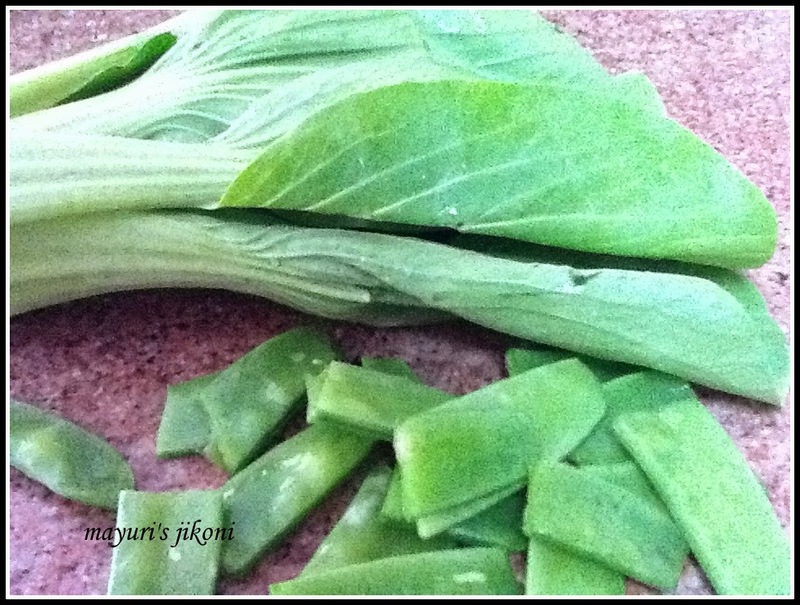 Add other vegetables to the pak choy if you like. Don’t overcook the vegetables. It tastes the best when they are crunchy and fresh.